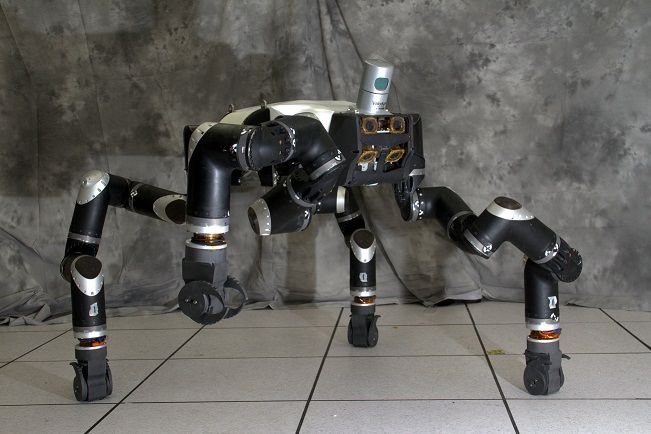 RoboSimian, a headless, ape-like robot, is now in training for the 2015 DARPA Robotics Challenge – and looks to be one “primate” with remarkable vision. Credit in part Velodyne LiDAR, whose HDL-32E LiDAR (Light Detection and Ranging) sensor will ride atop the unit. 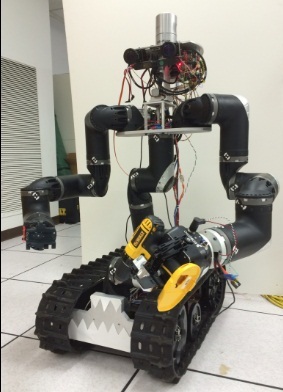 The robot – created by NASA’s Jet Propulsion Laboratory for the 2015 DARPA Robotics Challenge (DRC), a competition consisting of several disaster-related tasks for robots to perform – uses Velodyne’s spinning LiDAR sensor as a key element of the robot’s perception system. The sensor, which is capable of rotating a full 360° up to 20 times per second, enables the robot to look between 10° up and 30° down. 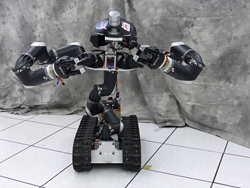 In the trials round last December, the JPL team won a spot to compete in the finals, which will be held in Pomona, Calif., in June 2015.